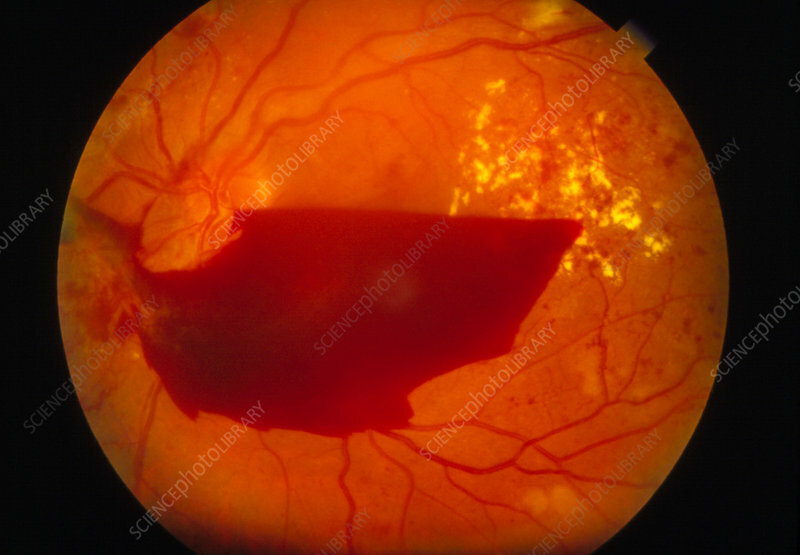 Diabetic retinopathy: fundus camera image of the retina of a human eye in advanced diabetic retinopathy. Diabetic retinopathy is the most common cause of preventable blindness in Western society. Its cause is obscure, although adult non- insulin dependent patients are more susceptible. Early (background) changes involve small arterioles & capillaries, with the formation of microaneurysms (swellings), haemorrhages (leaking vessels) & areas of capillary closure. Here, new blood vessels are visible around the optic disc (left), with a haemorrhage (red) and patches of hard exudates (yellow, right).